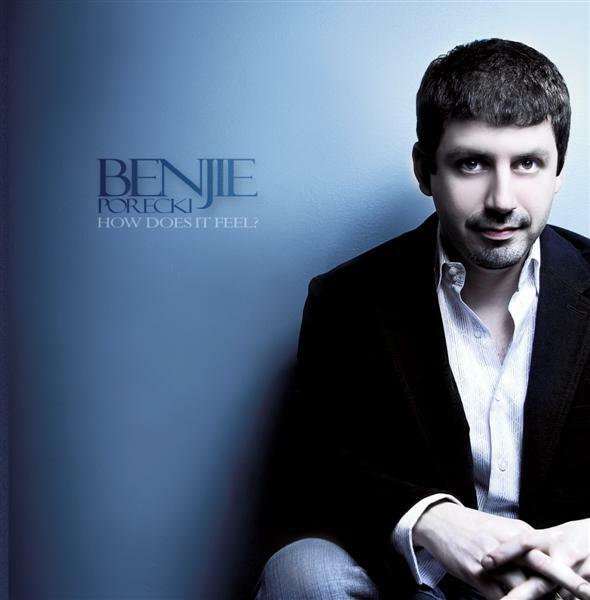 Benjie Porecki is an in demand musician. He performed with Pieces Of A Dream, Maysa, Stevie Wonder, Chaka Khan, Kim Waters and a lot more artists. He is equally at home in traditional jazz, cjazz, smooth jazz, pop, funk, R & B or urban. He plays keys in any kind of appearance like piano, organ, keyboard, but also sax and guitar. Studying the liner notes of smooth jazz CDs one will find his name on albums like Love's Silhouette (POAD), Velvet (Gerald Veasley), Phase II (Grainger) or Small, Medium, Large (WPG Trio). In 1996 he released his solo debut Going On Through, followed in 1998 by his second project Servin' It Up. After these all-instrumental albums he released in 2001 the more soulful album The Rest Of My Life. His new album How Does It Feel showcases beside his instrumental mastership Benjie Porecki's vocal talent. He has written, arranged and produced all tracks on this album. No cover in sight. Porecki: "I like the whole process of writing and the execution of the song. It's a really cool creative process. This one is more of funky, pop groove-oriented music with vocals on most of the tunes." The album starts with the groovy How Does It Feel? The title tune reminds me with its hipness of classic funk tunes like Pick Up The Pieces. Porecki shines on Wurlitzer electric piano (wonderful sound! ), Hammond B3 (the classic one! ), synthesizer and vocoder. Mercy! What a headbopping track. Greg Grainger adds a vibrant rhythm and the horn section (Dave Makowiecki - trumpet, Jeff Chiaverini - trombone, Scott Paddock - sax) is one of the finest. Are You Cryin'? is featuring Porecki's vocal potential. The song is about a ruined relationship, a finished love affair. There is no sorrow but happiness in this uptempo tune. In Lost & Found Porecki finds melancholic tones. The mellow recitation increases to volcanic eruption. Porecki has an awesome dynamic intonation. By the way he is an avid collector of analog instruments like Fender Rhodes, Hohner Clavinet or Hammond B3, of which he generously makes use. In the intro of the ballade Lovely Love Porecki smoothly touches the keys of his Fender Rhodes guiding directly to the emotional melody. This is love, warm and true it's pure in its way. The tune is colorful like a summer breeze. Porecki knows the effects of his instruments and inserts them well-directed. Everything revolves about love, Well There You Go is no exception. The track has a perfect groove. The horn section is kicking and I love Alfredo Mojica's percussion work. Alvin White adds a mesmerizing guitar solo and to the end of the track some thrilling distortion parts. Perfectly arranged and performed. Well dosed follows the Bossa Nova influenced instrumental All I Can Say (Is That I Love You). Benjie Porecki shows his brilliant magic on Fender Rhodes. When Porecki sings about Good Old Friends he certainly means the problematic relationship between friends. Transferred to music this is equally the encounter with Porecki's ancient beloved instruments. You Are Fineness is Porecki's ode to a new beauty. Taste the smell of Porecki's finest Fender Rhodes. Every tune on this album is a jewel like Thankful. Don't play this CD on your I-Pod but on your hi-fi equipment to catch the fine nuances of each instrument. Heartbeat starts with Connor Porecki's heartbeat in the uterus of Porecki's wife. This song is full of love, anticipating pleasure and jubilation about Benjie's unborn child. Prelude is Porecki's short piano solo prolog to the last tune Connor's Lullaby. Learn how caressing a Fender Rhodes can be. Andrew Webb (drums) and David Dyson (bass) are tenderly supporting Porecki's lullaby. I listened to this album with mixed feelings. Personally I prefer instrumental albums. Knowing that Porecki is a major contributor of instrumental music and to see him producing a vocal album makes me a bit uneasy. On the other side the result is absolutely convincing. Porecki has given us a wonderful present, authentic emotion transformed into music.